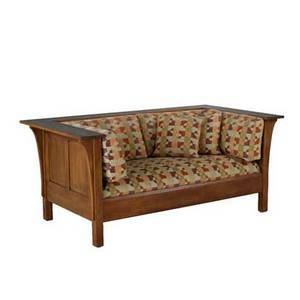 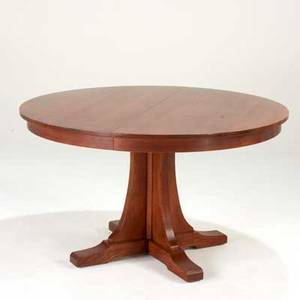 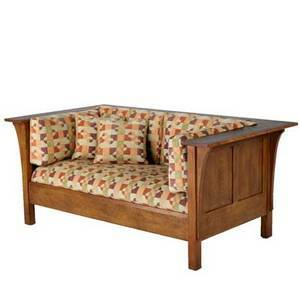 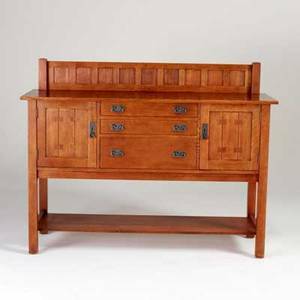 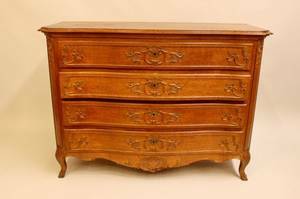 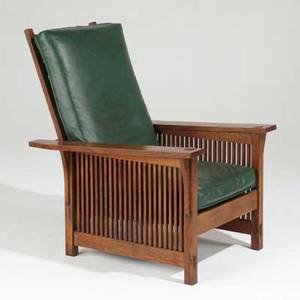 Stickley by e.j. 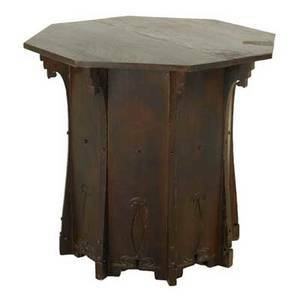 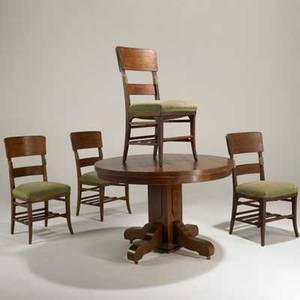 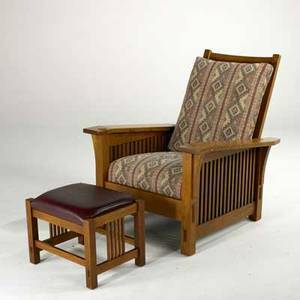 audi; contemporary flat-arm spindled morris chair with loose cushions, usa, late 20th c.; quartersawn oak, oak veneer and leather; stamped/metal tag; 38 1/2" x 29" x 34 1/2"
Style of charles rohlfs; octagonal lamp table with carved plank sides, usa, early 20th c.; quartersawn oak, some early 20th c. sections some later reconstruction; unmarked; 30" x 32" sq. 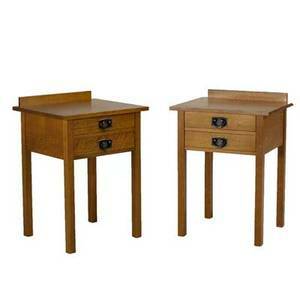 Stickley by audi; contemporary pair of spindled nightstands, late 20th c.; quartersawn oak and oak veneer; branded/metal tag; coffee table: 28" x 20" x 17 1/2"
Stickley by audi; contemporary sideboard with three drawers, two doors and gallery, late 20th c.; quartersawn oak, oak veneer and copper patinated pulls; branded/ metal tag; 46" x 60" x 22"
Stickley by audi; contemporary pedestal dining table with shoe feet and two 15" leaves, late 20th c.; quartersawn oak and oak veneer; 30 1/2" x 54" dia. 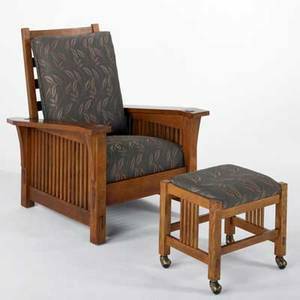 Stickley by audi; contemporary drop-arm morris chair with matching ottoman each with spindled sides, late 20th c.; quartersawn oak, oak veneer and chenille upholstery; branded mark/metal tag; 40 1/2"